no one ever said it was going to make sense, this life. and yet, we try to make it so. when things get too crazy (and things have gotten very crazy), i turn to nature for comfort, trees for solace, fresh air to move fresh thoughts through my mind. 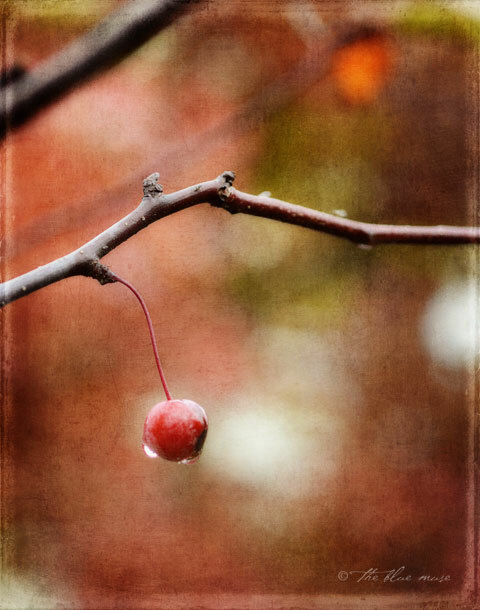 i find all the beauty i need in a single crab apple hanging low against a backdrop of fall colors. a flower fighting to stay in bloom despite cool days and colder nights. a crow landing on the very tiptop of a newly-bare tree, watching. this is the world i walk through best, a world where silence means breezes and bird calls, and solitude means surrounded by forest. if i could live in this world all the time, i would. but this is life, and there are other things that must be done, and so, of course, i must walk down streets filled with people, buildings, politics, trash. i have the heart of a hermit and the mind of a citizen. and in my dream of dreams, the soul of a poet. i can be silent forever. and then i must speak. i’ve never been very good at fitting into boxes, or groups, or categories, or round holes. in high school, i never managed to belong to any one of the dozens of cliques that formed my social landscape. i could walk through occasionally, mingle, say hello. but always, in the end, i was the lone tree standing just off to one side, watching. back then, it broke my heart. left me wondering what was wrong with me. of course, now, i know, and i accept, my introversion. i no longer fight it. i no longer wish to be someone other, though considering the possibilities as stories in my head can be quite entertaining. i am who i am, and i have reached the age where i can say that without cringing. i am multi-faceted, with many, many flaws and imperfections. i am no diamond in the rough, no emerald, no ruby. my kind of jewels hang from branches and stems. all the magic in my world comes from love and living. my heart is always on my sleeve, where i can hear each beat, beat, beat. it is how i know i am alive. This entry was posted on Thursday, October 25th, 2012 at 8:59 amand is filed under . You can follow any responses to this entry through the RSS 2.0 feed. You can leave a response, or trackback from your own site. and sounds like you’ve arrived…there’s a slowly breathing peacefulness in this…accepting who we are…i don’t find it always easy but think it’s the key to live a happy life..
…and i just love your pics…did i ever tell you..? Kelly, this spoke to me so today. your words are so powerful and your message is strong. i work hard at this and yet still have not found the peace you have. i love, love your words. thank you so much. i have the heart of a hermit and the mind of a citizen. and in my dream of dreams, the soul of a poet….nice…and it always being on your sleeve where you can watch it beat….glad you break the silence and speak cause when you do it rings with beauty…smiles. I completely relate to this post . . . I too am a fellow hermit and have learned to embrace it. I love how fresh air has the ability to move thoughts through our minds, the best therapy. Absolutely beautiful – this resonated with me on so many levels. While I don’t have the love of nature as you, I have that quiet hermit soul that watches and amuses itself. thank you for articulating this. Wonderful, wonderful! An excellent essayist, too. Multi-faceted indeed. From one introvert to another…loved. i told you getting older would loosen you up. that, combined with your wonderful beautiful truthful poetic soul, is a fabulous combination. You have such a beautiful site. It really sets a mood from the moment one steps in. This post in particular resonates so deeply with me – every word. I love reading because writers put into words what I feel in my heart. You have done that here. I’ve especially noticed lately a fierce determination to be myself at all costs, and to live every remaining day of my life in presence.